The stock tanked more than 11 percent. Last week, Tilray's stock posted a 12.8 percent gain after some sharp moves. Tilray's stock surged more than 77 percent in the first three trading days of last week but then dropped 47.9 percent to close out the week. Shares of Canadian pot grower Tilray fell sharply on Monday, erasing gains from a wild week that captivated investors everywhere. The stock tanked 19.1 percent. Last week, Tilray's stock posted a 12.8 percent gain after some sharp moves. 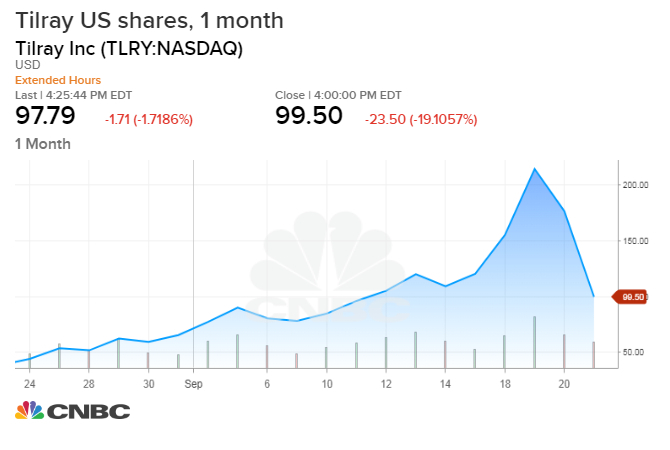 Tilray's stock surged more than 77 percent in the first three trading days of last week but then dropped 47.9 percent to close out the week. The initial jump sent Tilray's market cap to nearly $20 billion before ending the week around $10 billion. Two catalysts drove Tilray's initial surge last week. First, Tilray announced on Tuesday the Drug Enforcement Administration approved it to import marijuana to the U.S. for medical research. CEO Brendan Kennedy later told CNBC's Jim Cramer that global pharmaceuticals must think about partnering with cannabis producers as a "hedge" against the space. Tilray's meteoric rise also bolstered other marijuana stocks. The ETFMG Alternative Harvest ETF (MJ), which tracks marijuana shares, rose more than 10 percent last week. Shares of Toronto-listed Cronos Group, meanwhile, gained 18.3 percent, while Aurora Cannabis jumped 38 percent.